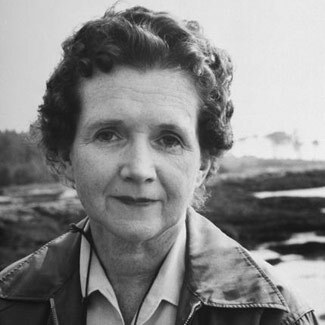 Rachel Carson is most well known for her book Silent Spring, which brought to light the harmful effects of pesticides on the natural environment and launched the environmental movement. It is widely regarded as the most successful and impactful work in its genre, since it incited a huge national response from ordinary citizens, leading to government environmental regulations. Rachel Carson was born in 1907 and grew up in Springdale, Pennsylvania, where from her bedroom window she could see the smokestacks of the American Glue Factory. She received a scholarship to Chatham University, where she began as an English major but soon switched to biology, where she was one of only three women in the major. She received her master’s degree in zoology from Johns Hopkins University while also performing research in the field of genetics. After pursuing a couple of teaching jobs, Rachel became a junior aquatic biologist for the Bureau of Fisheries. She did a lot of freelance writing about the sea and aquatic ecosystems on the side in order to bring in more income for her family. Rachel rose through the ranks and became an assistant aquatic biologist of the US Fish and Wildlife Service in 1939, and published her first book Under the Sea Wind two years later. This and her two subsequent books about the sea, The Sea Around Us and The Edge of the Sea, all became bestsellers, prompting her to resign from the US Fish and Wildlife Service and pursue writing full time. Silent Spring was the culmination of Carson’s research into the dangers that synthetic pesticides posed to both humans and the environment. In the process of her research, she reviewed hundreds of cases in which ecosystems had been damaged by DDT, a particularly dangerous synthetic pesticide, as well as cases where humans had suffered from cancer or other diseases because of exposure to pesticides. While many of her studies weren’t particularly new to the science community, Rachel was the first person to connect the dots between them and present them to the general population. In addition to doing this, she envisioned far-reaching consequences, saying that “our heedless and destructive acts enter into the vast cycles of the earth and in time return to bring hazard to ourselves.” Rachel Carson testified before John F. Kennedy’s Science Advisory Committee, as well as a subcommittee of the Senate about the dangers of pesticides, and her work would eventually lead to the creation of the Environmental Protection Agency (EPA) in 1970. Sadly, Carson never got to see all of the fruits of her labor, as she died in 1964 at the age of 58 after a long battle with breast cancer. Rachel Carson is often credited with starting the environmental movement, as much government action on environmental issues occurred in the years following her informing the public about the links between the natural environment and human activities. Among many other initiatives and policies concerning the environment, the Clean Air Act was passed in 1963, the Endangered Species Act in 1966, and Earth Day was first celebrated in 1970. Her fight to protect the natural world lives on in modern efforts to prevent climate change and preserve biodiversity. Not only was Rachel Carson a notable woman in science, her research and efforts launched a movement that continues to this day and may determine the course of the future.